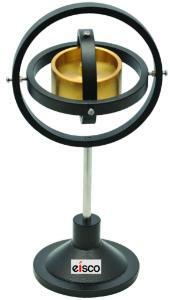 Mini version of the older classic Cenco Gyroscope. A 7.5cm brass wheel balanced is perfectly balanced with three pairs of adjustable pivots. The central axis has a small hole in it to wind a string around in order to get the gyroscope spinning. Once spinning students can push on the different axis to demonstrate how the applied force creates a torque that is perpendicular to the applied force.